The Embroidered Astrid Sage with Chocolate by Royal Hotel Collection is a rich contemporary Microfiber design in warm stylish tones. The duvet cover set is completed with coordinated Two Pillow shams, Two European shams and Two Decorative cushions. The over all look is one of the simplicity and elegance that will be enjoyed for years to come. 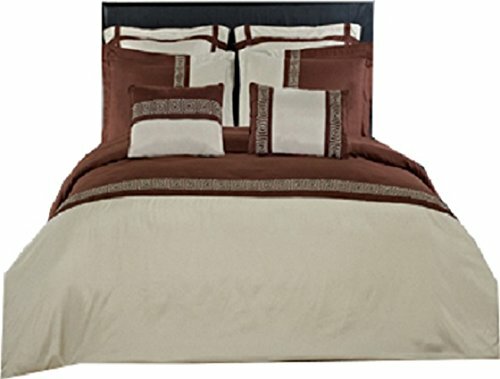 King/Cal-king 7-PC Set: 1 Duvet Cover 106×92″ with button closure, 2 Pillow Shams 20×36″. 2 Euro Shams 26×26″. 2 Decorative Pillows 12×18. Washing Instructions: Duvet Cover, Pillow Shams, and Euro shams are all machine washable.